USS Pastores (AF-16) from the port side at San Francisco on October 18, 1944, wearing what should be camouflage 32/14F. Drawings for this Design have not yet been found, but The Bureau of Ships sent drawings labeled 32/14F on September 16, 1944. Photo source: NARA BS 78276. USS Pastores (AF-16) from the starboard at San Francisco on October 18, 1944, wearing what should be camouflage 32/14F. The ship seems to be still painting the pattern. Photo source: NARA BS 77631. 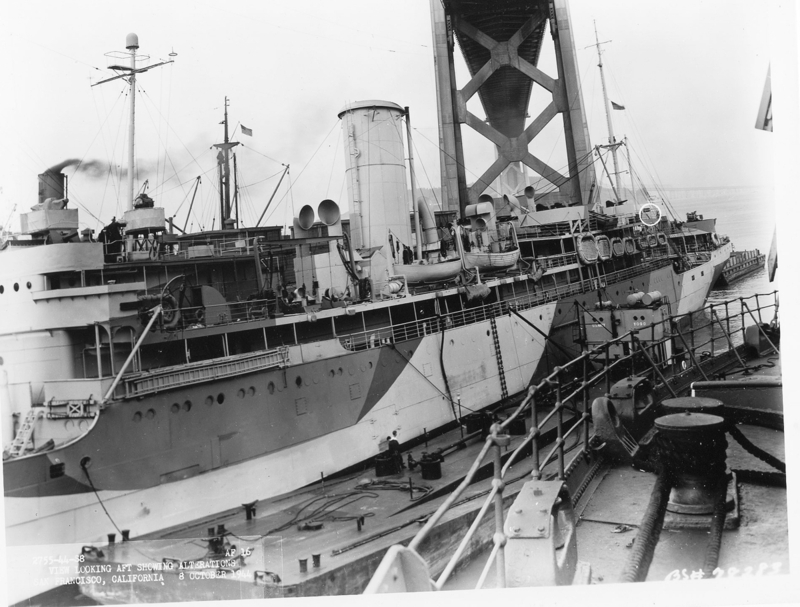 USS Pastores (AF-16) docked at San Francisco on October 18, 1944, wearing what should be camouflage 32/14F. Photo source: NARA BS 78283.